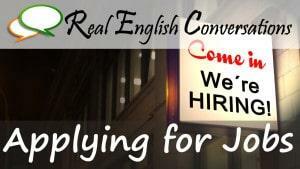 In this free English conversation podcast applying for jobs, we talk about applying for jobs and what it is like. Hear some interesting techniques we have used to get one. Hear about some of our experiences hiring people for our own business. To get more advice about job interviews, check out this podcast episode with 33 tips when applying for jobs and going to interviews. Or read the article about job interview tips here. If you like studying our real conversations, you might want to know that we have lessons and courses on our website that help students improve their speaking and listening skills too! Members of the Fluency Power Pack can join conversation practice sessions (with our teachers) and get access to high-quality online lessons that focus on helping you to USE your speaking and listening skills to become a confident, fluent English Speaker.